We believe that happy, loved and connected children are destined for success in every facet of their lives. Take the first step to higher education! Contact us for any questions you may have! We look forward to hearing from you! Our most cherished principle, "Hug First, Then Teach", defines every aspect of who we are at Kids ‘R’ Kids. Unlike many daycare centers or childcare providers, our approach is a whole child approach, working to strengthen and encourage every child’s emotional, intellectual, social, and physical being through the expert care of our child care providers and a unique partnership with parents. When it comes to teaching, Kids ‘R’ Kids understands the importance of involving families with the developmental milestones and accomplishments of their children - all the way from infant child care to preschool and throughout the school age program. When new skills are introduced or reinforced, having you, your child, and the teachers work together makes learning easy and fun. Using this streamlined approach to learning and keeping a close connection between home and school, Kids 'R' Kids ensures each child enrolled receives the individual guidance he deserves. Kids ‘R’ Kids offers a variety of unique features and advantages that set us apart from traditional childcare or daycare and mark us as an industry leader in early childhood education. Kids ‘R’ Kids is dedicated to maintaining a loving, happy, friendly environment . We understand that love is the most important key to any child’s growth. Our facilities are individually owned and operated. Owners are on-site to ensure availability to staff and parents. Most of our owners are parents and grandparents - their children are having a great time growing up in the family business. 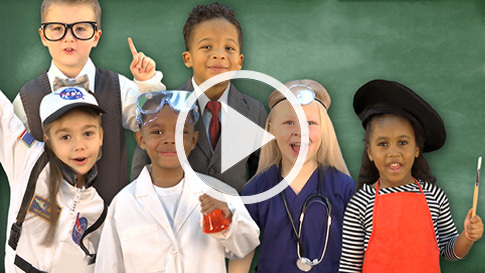 Our exclusive curriculum propels Kids ‘R’ Kids Learning Academy far beyond the daycare industry. Our full-time Kids ‘R’ Kids Education Department is always expanding the curriculum for a truly tailored approach to the early childcare industry. Your child’s safety and security is important to us. Our facilities have the highest possible childcare safety precautions, including features such as security cameras, staffed front desks, telephones in every room, and a coded, secure entrance. We offer a kid-sized cafeteria where nutritious meals are served daily. In our full-service kitchen, and certified food service staff prepares USDA-approved meals in a sanitary environment away from classrooms. Virtual access is always available for parents and grandparents to become involved in their child’s daily activities at school by viewing a password-secured site. We have a large activity room for school-age children. It is designed to accommodate fun times with friends, homework help, and an array of exciting activities. Infant, child and adult certification in CPR and First Aid is mandatory for our entire staff. Large separate playgrounds are designed for ultimate play for infants, toddlers, preschool and school-age children and are built to meet the American Society for Testing and Materials and Consumer Product Safety Commission guidelines. Kids ‘R’ Kids Learning Academy is the first national early childhood education franchise to be granted District Accreditation from the AdvancED Accreditation commission, the national commission that confers the Southern Association of Colleges and Schools Council on Accreditation and School Improvement (NCA/CASI, SACS/CASI and NWAC) accreditation seal. This means that the district and all of its schools are accredited, and that Kids ‘R’ Kids Learning Academy are recognized across the nation as a quality school system! What does Accreditation mean to parents? Through accreditation, Kids 'R' Kids International has made a commitment to achieve the highest possible standards in infant child care, preschool and elementary education. This accreditation ensures that we are meeting and exceeding the high accreditation standards unlike many local daycare or childcare providers. © 2015 Kids 'R' Kids International, Inc.